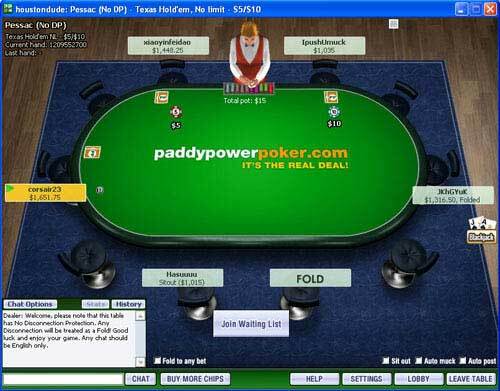 1) Visit Paddy Power Poker using the links on this page. 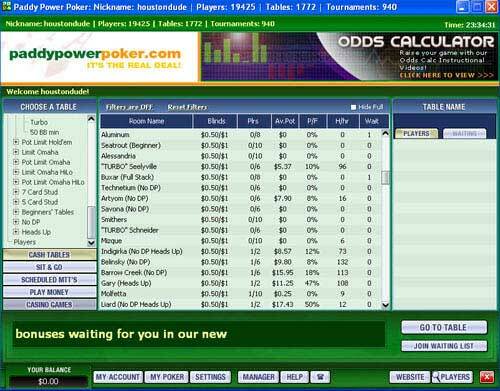 2) Download the software & create a new poker account. 3) Within 36 hours $5 will be added to your poker bankroll. 4) An additional $5 will be added to your account to be used on casino side games (within 36 hours). That is $10 free total! The Paddy Power Poker no deposit bonus is only valid for new accounts only. This offer is only valid for residents of UK or Irelend. Any unused bonus money will be removed from your account 7 days after it’s issued. The $5 free poker bonus requires earning 100 Power Points before cashing out. This can be done by raking only $6.25 at the poker tables. The $5 Paddy Power no deposit casino bonus must be wagered 50 times before it can be withdrawn, which means you have to wager $250 on any casino side game. Roulette, Blackjack, and Pontoon count as 5% for this wager requirement – all other games are 100%. You must meet the wager requirement 3 days after it’s issued. This offer won’t last forever. Take advantage of the Paddy Power Poker no deposit bonus today! In addition to the no deposit bonus, all players can receive a 100% up to $500 deposit bonus. Any deposit will be matched, up to $500. There is no Paddy Power Poker bonus code required to activate the bonus. Simply make your first deposit and it will be credited automatically. Players have 90 days to meet the clearing requirements, explained below. In order to clear the bonus, you must earn Power Points. For every 334 Power Points earned, $5 of the bonus will be released into your account. This means a total of 33,400 Power Points must be collected for the full $500. Every $1 paid in rake/fees generates 16 Power Points. This means the 33,400 Power Points required will cost $2087.50 in rake to clear. This bonus is a grind, but definitely doable. If your main game is $50 NL 6-max it will take the average player approximately 46,000 hands to clear. With the 90 day timeline that comes out to ~3,578 hands per week. See the sidebar for other stakes. You have to pay $2,087.50 in rake to collect the $500 bonus, meaning the bonus is worth 23.95% cashback. This is slightly below average. However, add in the fact that the Power Points you earn can be converted to cash, and the number increases. The 33,400 Power Points earned can be converted for $205 in cash through Paddy’s Power Rewards VIP Program. This increases the bonus to 33.77% cashback, which is above average. It’s also possible to increase this amount even more by building up your points and taking a larger cash payout at a better rate. Or you can choose to take a bonus instead of straight up cash for even more.